Camp Fire Wilani is excited to launch its services as an Outdoor School provider! OSU Extension directly reimburses schools 100% of costs associated with approved Outdoor School programs for 5th and 6th grade students. To view the OSU Extension funding application, click here! Or visit the OSU Outdoor School webpage here! We offer three-day, (and/or) two night programs at beautiful Camp Wilani @Havenroot: a biologically diverse, beautiful location with a pond, stream, Western pond turtles, rough skinned newts, a wide variety of birds, deer, and other wildlife. We have cozy, simple cabins with bunk beds that sleep between 8 and 12. Our non-residential, day-only programs are on special for Spring 2019! Programs are Monday – Wednesday from 8:30 AM – 4:30 PM (this time frame is adjustable) at 24487 Bolton Hill Road in Veneta. This is being offered at a reduced price for the pilot: $75 per student for all three days. Parent chaperones, faculty and staff are free of charge. Students should bring a hearty lunch. Schools are responsible for transportation. Or fill out our easy online application RIGHT HERE! Camp Fire Wilani is piloting a 3-day, 2-night residential, NGSS-aligned outdoor school program at Camp Wilani @Havenroot in Veneta, Oregon in Spring of 2019. Our programs are designed to meet the needs of individual classes and can be tailored to meet specific class needs by adjusting learning content and the inclusion of need-specific elements such as team building facilitation and positive conflict resolution. Spend three consecutive days at Camp Wilani @Havenroot without an overnight stay. 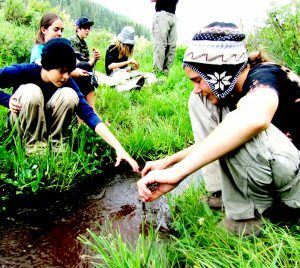 Designed to reduce travel costs and teach students about their local environments, this 3-day program comes to you. Our facilitators select a destination or group of destinations within 30 driving minutes of the school we are serving and provide place based-lessons from 9:00 am to 4:00 pm, any three consecutive days Monday-Friday. Our Outdoor School Leadership Team has participated in the BEETLES Institute out of Lawrence Hall at UC Berkeley. This innovative, student-centered, nature-centered system of teaching and learning is transformative, inclusive, and profoundly effective.